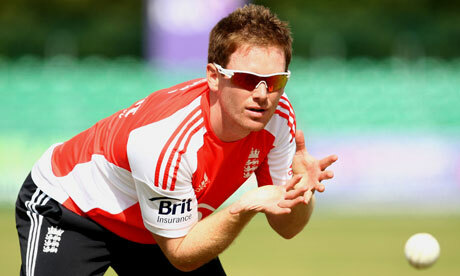 Eoin Morgan is back in Dublin to captain England for the first time – against the country that nurtured him. It would take an unrelenting individual not to surrender in some small way to confused loyalties. Morgan is just that sort of unrelenting individual. An England visit to Ireland is a double-edged sword. England is charged by the International Cricket Council to do its bit to help Irish cricket progress, and a one-day international in Clontarf as well as careers in county cricket is part of that arrangement, and Irish cricket must shrug helplessly whenever England raid its best players by promising them a brighter future over the water. Morgan, a former Ireland Under-19 captain, is the Irish-born cricketer, potentially world-class cricketer, who said farewell. He could have returned to Dublin full of blarney, told a few sentimental tales of his childhood cricket, recalled Ireland’s defeat of England in the World Cup with fond embarrassment, and openly revelled in their improvement. That is not Morgan’s way. Asked about conflicting loyalties, he told an anecdote that confirmed there were not any. He is a clinical man, certain of the direction he wants to take, and his return as England’s captain is a mark of that success. Ireland, throughout much of its history, has become hardened to losing some of its brightest talents. The collapse of the Irish economy has brought a talent drain comparable to the early 1980s, with Irish graduates arriving optimistically in London only to find that English graduates are upping sticks to Australia. William Porterfield, Ireland’s captain, dreams of Ireland producing enough cricketers to develop a first-class circuit, gain Test status and keep its players; Morgan instead praises Ireland for producing cricketers with the “hunger and desire” to play for England, seeing no tension in the arrangement that sees Boyd Rankin open the bowling for Ireland against England on Thursday barely a week after playing for England Lions. So these days do Ireland. Warren Deutrom, Cricket Ireland’s chief executive, has supervised quite an improvement since he took office four years ago, recognising that Irish cricket had to strive to match the ambitions of its players. Five miles up the road from Clontarf, where 5,000 will watch a game that has been sold out since mid-March, a new stadium is being built in Malahide. Such is the depth of the Irish recession that the joke can be heard that it is the only construction going on in the country. Pitches have been bedding in since autumn 2009 and the bankings are being constructed. Growing interest in cricket in Ireland even brought a €450,000 (£396,000) government grant. There were 15,000 active players four years ago; today there are 25,000. Cricket has sprung up again in such unlikely places as Connacht, on the west coast, enabling Deutrom to claim the first new provincial cricket union for 50 years. In four years, Ireland have been in four World Cups, successfully campaigned against an ICC attempt to freeze them out of the next one, and famously in Bangalore earlier this year beat England when they reached a target of 328 in the final over. “We are trying to offer a future to our young cricketers,” said Deutrom. For an instant adrenaline rush, nothing matches Kevin O’Brien’s 50-ball hundred against England in Bangalore, an unexpected, rustic assault that brought him the fastest hundred in World Cup history and took Ireland to victory with five balls remaining. He will face England once more at Clontarf. Morgan, who had played for Ireland in the previous World Cup, was not in England’s side because of a broken finger that ruled him out of the early stages of the tournament. “I only watched half the game,” he said. “Text messages were coming through but I was having a check-up on my finger.” Unemotional to the last.